THE MORINGA TREE, MORINGA OLEIFERA, IS CALLED MOTHER’S BEST FRIEND. That is one way they sometimes refer to this tree in the Philippines where the leaves of the malunggay, as they call it, are cooked and fed to babies. Other names for it include horseradish tree and drumstick tree (India) and benzolive (Haiti). Moringa is one of the most successful plants in ECHO’s seedbank. Moringa tree leaves, pods, and roots are eaten; flowers are loved by bees; and seeds are powdered and used to purify water from murky rivers. I believe it is one of the most exciting and versatile plants that we have in our seedbank of tropical plants. The leaflets can be stripped from the feathery, fern-like leaves and used in any spinach recipe. Small trees can be pulled up after a few months and the taproot ground, mixed with vinegar and salt and used in place of horseradish. Very young plants can be used as a tender vegetable. After about 8 months the tree begins to flower and continues year round. The flowers can be eaten or used to make a tea. They are also good for beekeepers. The young pods can be cooked and have a taste reminiscent of asparagus. The green peas and surrounding white material can be removed from larger pods and cooked in various ways. Seeds from mature pods (which can be 2 feet long) can be browned in a skillet, mashed and placed in boiling water, which causes an excellent cooking or lubricating oil to float to the surface. The oil reportedly does not become rancid and was once sold as “ben oil.” The wood is very, very soft, though the tree is a good living fencepost. It makes acceptable firewood but poor charcoal. It is an extremely fast-growing tree. Roy Danforth in Zaire wrote, “The trees grow more rapidly than papaya, with one three month old tree reaching 8 feet. I never knew there would be such a tree.” The tree in our organic garden grew to about 15 feet in 9 months, and had been cut back twice to make it branch out more. It is well to prune trees frequently when they are young or they will become lanky and difficult to harvest. Where people begin breaking off tender tips to cook when trees are about 4 or 5 feet tall, the trees become bushier. The folks to whom we have sent the tree in Africa have been pleased at its resistance to dry weather. Rob Van Os rated its growth, yield and potential as exceptional and added that it “can be planted after the other crops, even near the end of the rains.” He has introduced it into several villages already. The first plants grew so well for Gary Shepherd in Nepal that he had us arrange for sending him 1,000 of the large seeds. He reports that at five months one was 12 feet tall and most were 6 feet. There is more good news. The edible parts are exceptionally nutritious! Frank Martin says in Survival and Subsistence in the Tropics that “among the leafy vegetables, one stands out as particularly good, the horseradish tree. The leaves are outstanding as a source of vitamin A and, when raw, vitamin C. They are a good source of B vitamins and among the best plant sources of minerals. The calcium content is very high for a plant. Phosphorous is low, as it should be. The content of iron is very good (it is reportedly prescribed for anemia in the Philippines). They are an excellent source of protein and a very low source of fat and carbohydrates. 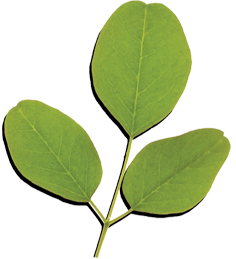 Thus the leaves are one of the best plant foods that can be found.” In his Edible Leaves of the Tropics he adds that the leaves are incomparable as a source of the sulfur-containing amino acids methionine and cystine, which are often in short supply. Beth Mayhood with Grace Mountain Mission wanted to establish a model vegetable garden on a small piece of land. “It was windswept and sunbaked with no natural barriers or trees in the area. Soils were poor and very alkaline. The salt content was also high. We started in January to prepare large quantities of compost. In April holes were dug in the poor soil and filled with compost. Benzolive trees planted in seedbeds germinated in 3-4 days. In 9 weeks they were transplanted in between the garden beds, around the edge of the 200 x 250 ft area and in a double row about 5 ft apart in the middle. The trees protected against the prevailing winds.” I saw slides of this spot later. It was impressive. The light shade of the tree is a considerable help to most vegetables. Ronald Watts in Zimbabwe sent a copy of a letter to the editor that he wrote concerning moringa. It was published in “Productive Farming” magazine. “…I noticed several villages growing trees that I was unfamiliar with. They turned out to be Moringa oleifera. What was remarkable is that they were being grown for their leaves. One homestead had over 30 of these trees growing in a circle. In 36 years of wandering around Africa this was the first time I had seen trees grown in a traditional village purely for their leaves. The farmers said that the leaves were in high demand from their neighbors particularly in times of famine. Fresh leaves appear towards the end of the dry season when green food is in short supply. This tree would seem to have immense potential for improving human diets particularly in the hot and dry areas of Zambia and Zimbabwe. …[Moringa] would seem to have great potential for feeding livestock. Several Zambian farmers who have tried leucaena for this purpose have been disappointed because it is extremely susceptible to termite damage. Moringa has the advantage that it is less susceptible and can be grown from cuttings. A 2-meter cutting means that from the day of planting the top of the tree should be out of reach of goats.” Ronald says that though palatable to termites, moringa seems to be able to resist the challenge, particularly when grown from cuttings. 3. An acceptable “mock asparagus” soup can be made by boiling the cut pods until tender, easoned with onion. Add milk, thicken and season to taste. COOKING THE PEAS. Alicia Ray writes that the seeds, or “peas,” can “be used from the time they begin to form until they begin to turn yellow and their shells begin to harden. Only experience can tell you at what stage to harvest the pods for their peas. “To open the pod, take it in both hands and twist. With your thumbnail slit open the pod along the line that appears. Remove the peas with their soft winged shells intact and as much soft white flesh as you can by scraping the inside of the pod with the side of a spoon. Place the peas and flesh in a strainer and wash well to remove the sticky, bitter film that coats them. (Or better still, blanch them for a few minutes, then pour off the water before boiling again in fresh water.) Now they are ready to use in any recipe you would use for green peas. They can be boiled as they are, seasoned with onion, butter and salt, much the same as the leaves and young pods. They can be cooked with rice as you would any bean. “Blanch both peas and pods’ flesh, drain. Remove milk from 2 1/2 cups grated coconut by squeezing water through it two or three times. Crush ginger root and garlic, save half for later. Mix peas, flesh, coconut milk, ginger and garlic together with onion, bouillon cubes, oil, salt and pepper. Bring to a boil and cook until the peas are soft, about 20 minutes. Fry remaining coconut until brown. Fry remaining half of crushed ginger root and garlic in 2 T. oil. Dice eggs. Add coconut, ginger, garlic and eggs to first mixture, heat through. Serves 6. THE ROOTS. The tree is uprooted and the roots grated like horseradish. Alicia Ray says to one cup grated root add 1/2 cup white vinegar and 1/4 t. salt. “Chill for one hour. This sauce can be stored for a long time in the refrigerator.” The following caution quotes from a recent review by Dr. Julia Morton in Economic Botany. USE AS AN ANTIBIOTIC. A study at University of San Carlos in Guatemala is summarized. Herbal applications are commonly used to treat skin infections in developing countries, although few investigations are conducted to validate scientifically their popular use. A previous study had showed that moringa seeds are effective against skin infecting bacteria Staphylococcus aureus andPseudomonas aeruginosa in vitro (i. e. in a test tube). This study showed that mice infected with S. aureus recovered as quickly with a specially prepared aqueous extract of moringa seed as with the antibiotic neomycin.